Gridthiya Gaweewong was born in Chiangrai, Thailand in 1964. She co-founded an independent art organization, Project 304 in 1996 after receiving her MAAA (Master of Arts in Administrations and Policy) from the School of the Art Institute of Chicago. Gaweewong is currently the artistic director of the Jim Thompson Art Center, Bangkok. Gaweewong has curated numerous exhibitions including Under Construction (Tokyo, 2000-2002), Politics of Fun at the Haus der Kulturen der Welt, Berlin (2005), the Bangkok Experimental Film Festival (1997–2007), the Saigon Open City in Ho Chi Minh City, Vietnam (2006-2007) and Unreal Asia, Oberhausen International Short Film Festival (2009 and Between Utopia and Dystopia, MUAC, Mexico City (2011) among others. She has recently curated The Serenity of Madness, a solo exhibition of Apichatpong Weerasethakul, produced by Independent Curators International (ICI), New York, MAIIAM Contemporary Art Museum, Chiangmai, and travelled to the Museum of Contemporary Art and Design, Manila, Parasite, Hong Kong, Sullivan Galleries, The School of the Art Institute of Chicago, Chicago, the Oklahoma City Museum of Art, Oklahoma and Núcleo de Arte da Oliva, S. João da Madeira, Portugal. (2016-2018). 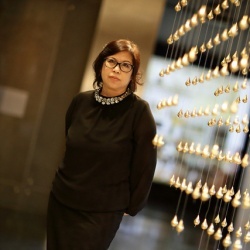 Recently, she served as the curatorial team of the 12th Gwangju Biennale, South Korea, and curated the exhibition Facing Phantom Borders.